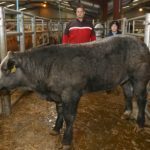 United Auctions held its end of season sale of all classes lambs and sheep at Dalmally Auction Mart. A mixed entry of stock sold to a good ringside of buyers at the sale on Friday November 16. Lambs recorded a rise of £2.38 on the year. Ewes sold at similar rates. TEXx: £68.00 – Tiretigan : £59.00 – Ardchatten HF : £55.00 – Tiretigan : £50.00 – Ardchatten HF. CHEV: £42.00 – Maam Farm. BF: £50.00 – Waterland : £48.00 – Invernahyle : £45.00 – Ardchatten HF : £44.00 – Glenfeochan Estate. TEX: £47.00 – Lephinkill Farm. MULE: £37.00 – Drimnin Estate. BF: £31.00 and £28.00 – Simec Lochaber. TEXx: 153p – Drimnin Estate : 153p – Tiretigan Farm : 151p – Tiretigan Farm. CHEV: 131p – Maam Farm. MULE: 141p – Birchfield : 138p – Simec Lochaber : 133p – Couston Farm. BF: 141p – Glenfeochan Estate : 141p – Maam Farm : 135p and 125p – Invernahyle : 125p – Ardchatten HF.